With three days of tournament action, intense plays, big swings, and momentous celebrations, Pro Tours create a number of thrilling moments that etch out a place in our memories. 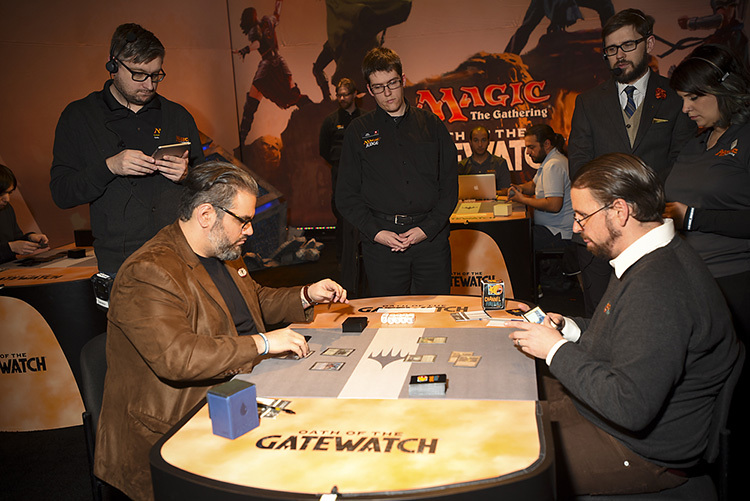 This weekend, we've compiled our top five moments that made Pro Tour Oath of the Gatewatch a show to remember. 5. "You come here often?" "All the time." It was a cute moment, but a bit telling in hindsight. Sitting at the top draft table were a number of the best players in the game, including Hall of Fame Pro and perennial top table drafter William Jensen. Also at that table was Frank Lepore, here on his first Pro Tour and doing very well. Frank, trying to keep the mood light, opened with a joke. At the end of the day, however, it was Lepore who went 3-0 in the draft and made the Top 8. 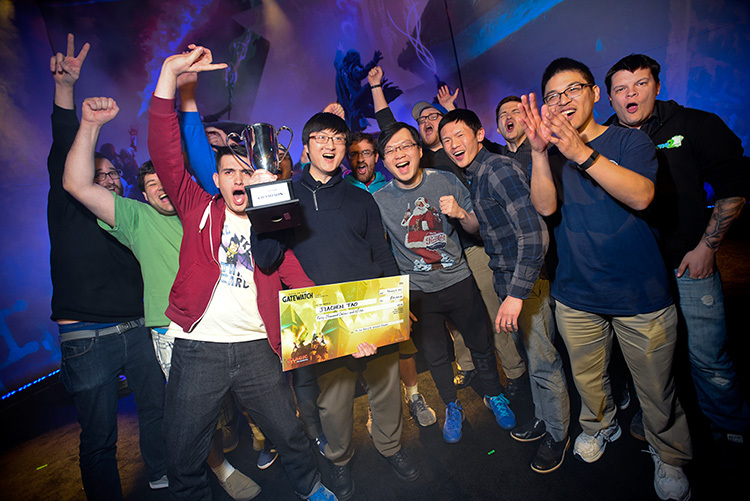 While all eyes were on the Top 8 of Pro Tour Oath of the Gatewatch, there was far more on the line than just the championship trophy. 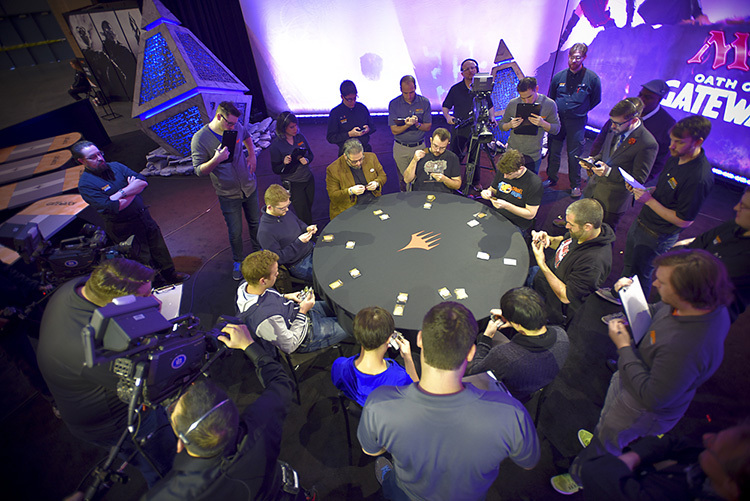 The title of Mid-Season Master—and the invite to the 2016 Magic World Championship that came with it—was decided in Atlanta as well. A host of players entered the weekend with a shot at the honor, and they jockeyed for position all throughout the tournament. While ninth-ranked Fabrizio Anteri made a push thanks to his victory at Grand Prix Mexico City last weekend, he still needed to make up distance at the Pro Tour. In the end, it was Owen Turtenwald that claimed the prize. It's no surprise that the game's No. 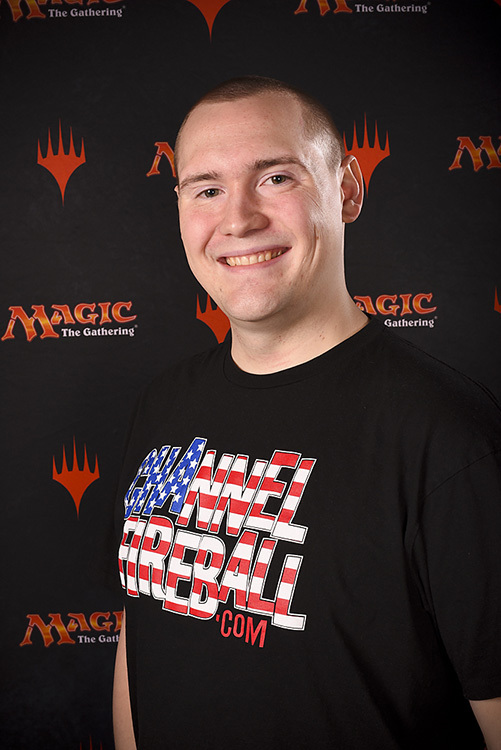 1 ranked player would come out on top, and thanks to his run to an 18th-place finish at the Pro Tour, you can look forward to seeing Turtenwald, last year's runner-up at the Magic World Championship, back to try and improve on that finish. Frank is playing Processor Eldrazi while Luis is playing a slimmer, sleeker version of the archetype, Colorless Eldrazi. The first two games are mostly lopsided affairs, and we head to a third game. In the third game, the two match each other blow-for-blow and get into something of a stalemate on the battlefield. Eventually, Scott-Vargas maneuvers his way to an advantage and is able to start taking chunks out of Lepore's life total. Attack after attack staggers Lepore, dropping his board presence along with his life total. When things finally settle down, Lepore sits at a paltry 1 life. However, all of the extra land he's drawn has enabled him to start activating Eye of Ugin, searching up some of his powerful processor Eldrazi to even the board again, if not giving him a slight advantage. Scott-Vargas is low on gas and lacks any of the Blinkmoth Nexus that would let him deal the final point of damage. It looks like Lepore has finally turned the tables back in his favor, and possibly back to a Top 8 berth. But then Scott-Vargas draws Oblivion Sower and, thanks to the advanced game state and multiple used copies of Relic of Progenitus, steals a whole lot of lands. Now he looks like he'll get to activate Eye of Ugin to keep pace with Lepore. The game could have legitimately gone on another 20 minutes. You see, the turn after Scott-Vargas drew the Oblivion Sower, he drew a sideboard card not many might have expected to be in his deck against Lepore's large Eldrazi. It was the one card that was the absolute perfect draw against an opponent on 1 life, an opponent who was trying to make his first Top 8. It was literal. It was metaphorical. Scott-Vargas Gut Shot his way to the key 12th win and Lepore fell short for a second round in a row. It wouldn't be until two rounds later that Lepore would sneak into the Top 8 on tiebreakers. But in that moment, it was the Gut Shot heard 'round the, well, at least around Twitch and Reddit. The whole game, by the way, is one of the highlights of Day Two. You can find the round in its entirety below. When the standings and pairings for the final round were put up, it looked like all of the drama would be sucked out of the room. There were exactly eight players who could draw into the Top 8, leaving no room for anyone else. The two top seeds, Shuhei Nakamura and Ivan Floch, had incentive to draw into the first and second seeds. It seemed like everything was sewn up. Nakamura and Floch conferred prior to the last round. What they saw was an opportunity to get some better match-ups in the Top 8 if they won. Even if they lost, it was likely they'd keep high seeds with good tiebreakers. So they decided to play and, possibly, crush the dreams of their opponents. Both Nakamura and Floch won. Floch defeated Jason Chung, who was a draw away from the Top 8, and knocked him out. Nakamura won as well, but his opponent, Jiachen Tao, had high enough tie breakers to sneak into the Top 8 in exactly eighth place. Tao was almost knocked out by Nakamura and Floch's call. But, by the grace of good tiebreakers, he was safe. And it looks like Nakamura and Floch were right to try to keep him out. Both players lost to him in the elimination rounds. But who was the other person who snuck in thanks to Nakamura and Floch playing it out and winning? That was Frank Lepore, who otherwise would have gone from first to a near miss thanks to a string of losses. His win in the final round, and Nakamura and Floch's wins, helped make his first Pro Tour a memorable one. Jiachen "JC" Tao looked at a beautiful opening hand. He had already clinched a pair of games against Pro Tour Champion Ivan Floch. "Don't mess up," he thought to himself as Floch was forced to mulligan. Then, in just a few short turns, it happened. We've all spent countless hours scribbling card names in notebooks, trying to make a Magic deck that would be deemed unfair. This weekend, that dream became a reality for Tao and his friends in Team East West Bowl. Their Blue-Red Eldrazi deck took the tournament by force. Only four people played the deck. The deck went 19-1 on Day One. 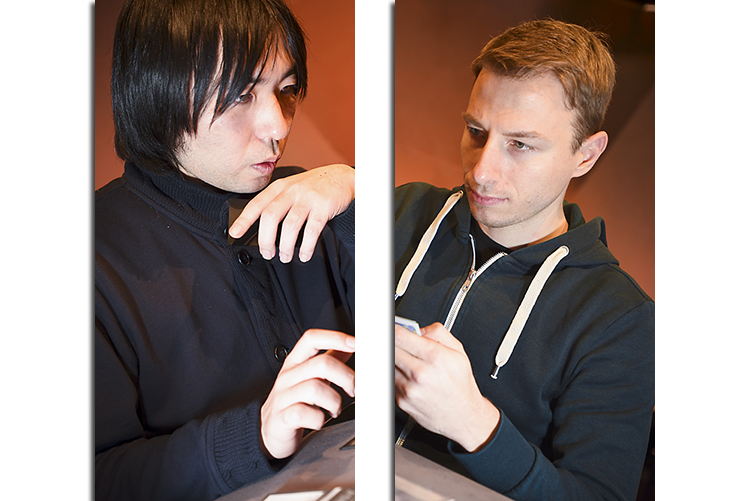 Two of the four, Tao and Andrew Brown, found themselves in Top 8 when the dust settled on Saturday evening. This is a deck filled with draft cards. Eldrazi Skyspawner, Vile Aggregate, Ruination Guide, and Drowner of Hope weren't exactly the cards we expected to dominate Modern. A ragtag group of friends working with East West Bowl put together the perfect combination of cards, and dominated Magic's biggest show. The best teams in the world practiced and planned for weeks and couldn't contend with their spark of innovation. Most of us weren't familiar with Jiachen Tao at the beginning of this weekend. He was another face in the crowd of hopeful Pro Tour anonymity. JC Tao made his presence known with his actions. He and his friends brought a deck that no one expected, and overcame unbelievable odds to achieve every Magic player's dream. Tao crushed Hall of Famer Shuhei Nakamura in the quarterfinals, ran over Hall of Famer and Pro Tour champion Luis Scott-Vargas in the semifinals, and smashed Pro Tour champion Ivan Floch in the finals. Jiachen "JC" Tao became the Pro Tour Oath of the Gatewatch Champion, and his performance and deck were easily the top moment of the weekend.